This meme comes via MiniKat. The rules are: Once you've been tagged, you are supposed to publish a blog post with 25 random things, facts, habits, or goals about you. At the end, choose up to 25 people to be tagged. You have to tag the person who tagged you. 1. My very earliest memories are textile related. As a wee girl I was allowed to play with my great-grandmother's quilting squares. She was bedridden and hand-piecing quilt tops was how she occupied her time. Most of the squares were very small, 1 inch squares. Her stitches were very small too. I have three of her quilts. Somewhere. One of them is the beloved, much used and therefore much worn bedspread of my childhood. 2. In my early 20s I developed a passion for quilting. I completed about four quilts, all by hand. Some of them can be seen here. 3. I now have a goal to photograph and post the other two on my Fiber Gallery as well. This is thanks to this meme because in the rules it says we can include goals as part of our 25 random things! 4. My grandmother was a knitter. She taught me to knit several times. This is because I would let lose interest for years at a time. I still have the afghan she knitted back in the 1970s for me. 5. The last time I learned to knit was after I learned to spin. Once the handspun started piling up, I had to do something with it! My grandmother had passed away by then, but there was a knitter in our homeschool group who held an informal class at her home. I've been knitting regularly ever since. 6. #5 points to the fact that I am a project person rather than a process person. I know spinners especially can become yarn collectors by virtue of spinning for spinning's sake. While I acknowledge the value of learning a process or trying something new, my mind is always hounding me with "Now, what can I do with it." 7. Writing random thing #6 brings to mind another dichotomy, this one within myself. I have a creative dilemma which sometimes troubles me. It surfaced in my awareness once again after reading Peg's post, "Focus". I have two creative bends which compete for my focus - weaving as an art form of itself (i.e. nonfunctional self-expression) and weaving to create a beautiful environment (functional self-expression). Rather than creating a tension which motivates me, it serves more to stagnate me. For that, read Peg's "Focus: A Postscript." 9. I learned to sew in junior high, but was never satisfied with sewing patterns the way they were. I was forever combining three or more to get what I wanted. 10. Consequently my mother thought I should go into fashion design and wanted me to attend the Art Institute of Chicago. I didn't like designing clothes that much. 11. Then she wanted me to go there to study painting, which I didn't like that much either. As a compromise, I enrolled at Southern Illinois University - Carbondale, as an art major. I had no motivation for painting, but that was where I saw my first floor loom. I knew then and there that this was what I wanted to do. Unfortunately, I had to take two years of preliminary art courses to get to that particular weaving class. I didn't have the self-discipline to do that. 12. I took my first spinning lesson shortly after that, from a demonstrator who was kind enough to invite me to her home to give me a spinning lesson. I only had one lesson, but I carried the pleasure of that experience with me for about 20 years. 13. Many years later I taught myself to spin on a drop spindle. I had no clue as to what I was doing, even though I followed the instructions in the book that came with the drop spindle kit. My very first yarn was as thick as my finger, and this was a single! I have a photo of that yarn, here. 14. The break through came when I got Melba Montgomery's Drop Spindle Spinning. What a revelation to discover that I could split the roving! Things improved considerably from that point. 15. I gave up spindle spinning when I developed an ache in my left shoulder and could no longer hold the spindle up. Several years later this developed into full blown adhesive capsulitis ("frozen shoulder") which rendered me completely non-functional for six months. Because of that experience, I have extreme empathy for anyone in chronic pain. 16. My first wheel was a Babe's Production Machine. I got it because it was what I could afford. I got teased about it, but it made yarn and that was all I cared about. 17. Eventually I saved up enough to get a "real" wheel. After extensive research, I bought an Ashford Traditional, single treadle. 18. 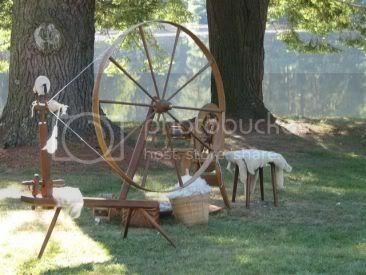 For a number of years I did historical spinning demonstrations. I would bring the Babe with me, put commercial yarn on the bobbin, and invite folks to try their hand at it. All they had to do was to "spin" the yarn back onto the bobbin, but they quickly learned this wasn't easy! It was a good teaching tool and it also kept them from wanting to "try" my wheel. 19. Eventually I saved up enough for my Kromski Minstrel. I got it because I thought it would be portable, but alas, it really isn't. I like it very much anyway, and it is my most used wheel these days. 20. My Kromski is set up double drive, my Ashford is set-up for Scotch tension. I have no preference about this either way. 21. About nine years ago my DH decided I needed a loom. I was pretty content with spinning and knitting at the time, so I was surprised when he came up with this. He kept insisting, so I signed up for a one day weaving workshop and told him I could live with a Schacht Wolf Loom. He bought me a used 4-shaft Mighty Wolf and my journey into weaving began. 22. I've taken a couple of weaving classes, but am mostly self taught. True to my project person self, I used my very first sample to make a pieced work vest. Now I have boxes and boxes of samples and yardage, all waiting for me to do something with them. 23. The truth of the matter is that I'm a bit intimidated with the whole process of sewing with my handwovens. But I do have a goal to learn. I am equally intimidated about using my handspun in my weaving. I have a goal for that too. 24. DH did make an error in thinking when he got me that first loom. He thought that once I got a loom, I would have absolutely everything I needed to be a happy, productive fiber artist. Little did he know. A whole roomful of yarn and weaving gadgets later, I "outgrew" my little 4-shaft loom. We found a 2nd-hand Glimakra Standard loom (59" weaving width) advertised in my guild newsletter and went to "just take a look". (You can read about that, here. ) DH was again, the motivating force behind this purchase. As you can tell, he's not only my best friend, but my most enthusiastic supporter and source of encouragement. 25. I once had a goal to work my way through all the families of weave structures. This goes back to a mindset that to be a knowledgeable weaver, I need to be familiar with all of them. Besides being easily distracted from this goal, I quickly discovered that it is difficult to truly understand a weave structure with just a few samples. However, this has helped me to choose areas that I want to explore further. This is why I signed up for the Complex Weaver's Tied Weaves Study Group, because I fell in love with summer & winter. So there you have it. 25 random things about me. Actually, that was easier to do than I thought it was going to be. Now. If you've gotten this far, consider yourself tagged! I get close to 250 hits a day on this blog, so 10% compliance isn't too much to ask for, is it folks? ;) If you do participate, please let me know. I'd love to come read your 25 random things. I won't list any, but for a blog page with all the posts under my "meme" label, click here. Ah Leigh, you are more of a detail person than I. It's fun to read through your 25. I'm still working on mine. I think one has to be a detail person to thrive and enjoy fiber arts but there's still a spectrum. I love your exploration of weave structures but am thinking more and more about Sara Lamb's adherence to tabby. Think, think, think - said Winnie the Pooh. What a delightful self-portrait and map of your fibre journey (so far). Thanks for sharing it. I like your "25" with a fiber theme! I have been tagged on Facebook but have no patience for this kind of thing. But I did enjoy yours! Gosh, 25 things wasn't enough for me. Can you do another 25 about you? Very interesting! You just have to love grandmothers, mine gave my mother and I the love for crochet which lead me to so many other things, knitting, spinning, quilting, weaving and more. Leigh, I was very impressed with your first yarn! mine was bumpy an lumpy and totally uneven.... and I didn't really value it at all, as it ended up in the garden - as a tie for my runner beans! :)) as you can see - I am just like you in finding practical uses for my stuff! nice reading, I think those tags say a lot about the people who take part! Thank you for your 25 things Leigh! After reading them, it is easy to see why your fiber work is so lovely, and why you love working with fiber. But I guess I can't really call it "work", now can I? Love your 25 things!! I, too, could happily ready another 25 things from you. I may play along next week - I'm thinking right now.